FVP’s Featured Author, Jeffrey Cook received an award from Moonrise Book Blog in their 2014 Reader’s Choice Awards. 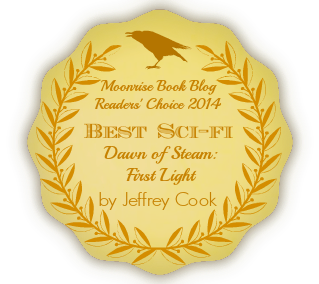 His book, DAWN OF STEAM: FIRST LIGHT was chosen as BEST SCI-FI book of the year! This entry was posted in Awards, Community, Contests and tagged best books 2014, Book of the year, Dawn of Steam, Jeffrey Cook, Sci-Fi by freevalleypublishing. Bookmark the permalink.